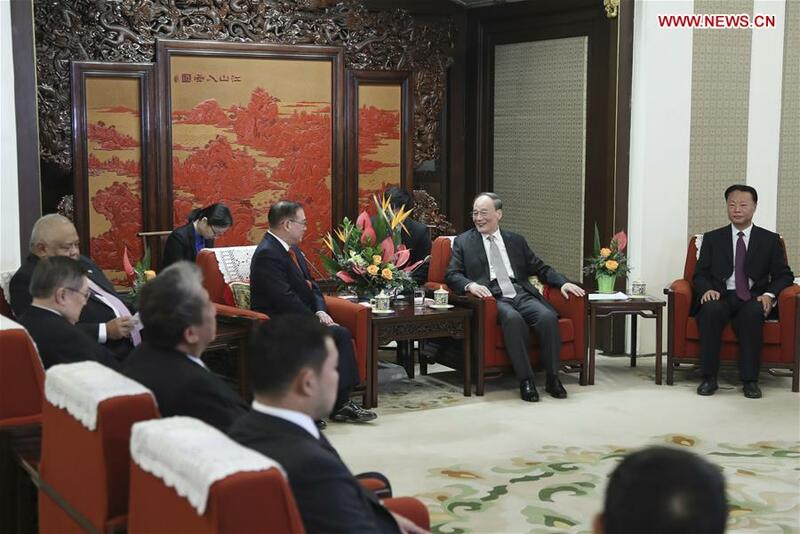 BEIJING, March 19 (Xinhua) -- Chinese Vice President Wang Qishan met with a Philippine government delegation led by Foreign Secretary Teodoro Locsin, Executive Secretary Salvador Medialdea and Finance Secretary Carlos Dominguez here Tuesday. "Peace is the prerequisite of development," said Wang, adding that both Chinese and Filipinos hope to live a better life through peaceful development. He called on the two sides to strengthen understanding of each other's past and present, consolidate the foundation of mutual trust, pursue common development, share opportunities and plan for the future, so as to make the relationship of comprehensive strategic cooperation more mature and jointly build a community with a shared future for humanity. The Philippine side said the Philippine government is committed to constantly pushing forward relations with China and stands ready to take part in the Belt and Road construction.